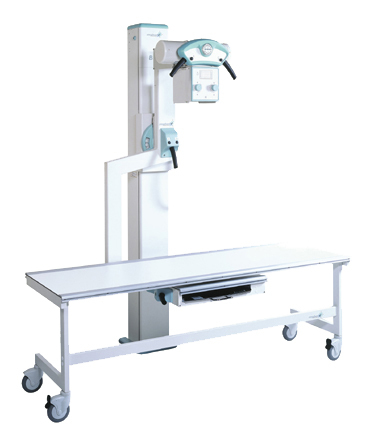 More than four billion people are faced with poor medical services for lack of basic x-ray equipment. A study at Northwestern University uncovered a need for 80,000 machines to serve remote areas of underdeveloped countries. 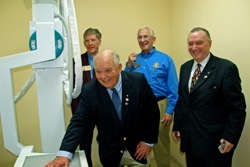 Our District initiated a pilot project together with Rotary clubs in Guatemala to install 29 x-ray machines in an unique arrangement that includes the Ministry of Health of Guatemala and the Pan American Health Organization. It is expected that this project can be duplicated in any country where Rotarians are present. In the meetings participated PDG Pam Kerr, Chair of the Committee, Rotarian John Vanden Brink from the Park Ridge club, the creator of the x-ray initiative, Park Ridge PE John Davis, webmaster of http://www.dicsh.info/, District Governor Carlos Früm, PDG Bruce Baumberger, Larry Sieb, an ex-employee of GE who has been helping us with the project, and Herman Oosterwijk, a Rotarian from Texas with extensive experience in x-ray technology. The enthusiasm showed by the industry participants in the meetings was most encouraging to the team. 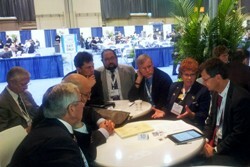 Siemens photo: Around the table left to right: DG Carlos, Rotarian John Vanden Brink, PE John, Francois Nolte, Siemens’ VP of Sales X-Ray Products, Wilson Herrera, Siemens’ Manager Central and South America, Rotarian Herman, PDG Pam, Norbert Gaus, Siemens Healthcare CEO. 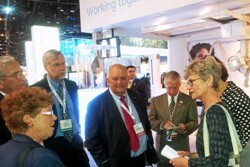 GE Healthcare photo: From left to right in a circle: PDG Pam, DG Carlos, Rotarian Herman, Rotarian John Vanden Brink, PE John, (hidden) Rima Alameddine, GE Healthcare General Manager, X-Ray and Mammography for Latin America, Anne LeGrand, GE Healthcare VP and General Manager for X-Ray Products.